Air Rings for back-pressure bleed, back-pressure, flow and differential systems have inner rings - the gaging surface - manufactured of hardened steel, chrome plate or carbide. Outer rings are aluminum for lighter weight comfort in hand-held gaging. 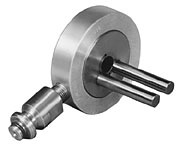 Thru-hole and close-to-shoulder styles are available in a variety of sizes, and with 2 to 6 nozzles, depending on dimensions. Sizes range from .120 inches (3.05mm) to and including 6.010 inches (152.65mm).